This page is targeted at carers and family members of individuals with dementia. It aims to provide information about physiotherapy practices which can help improve the quality of life of persons with dementia. It also provides guidance on when it is necessary to contact the physiotherapist or other health professionals for support. 4.1 How can the physiotherapist help? 6.1 How can the physiotherapist help? While many different diseases can produce the symptoms of dementia, it is known that Alzheimer’s disease is the most common cause, possibly accounting for 60-70% of all cases. Dementia mainly affects people over the age of 65 and its incidence increases with age. Around the world, 50 million people are believed to have dementia with millions of new cases each year. Dementia affects a large percentage of the UK population. There are currently around 750,000 people in the UK living with dementia, and this is expected to rise to 1.4million by 2039. To maintain quality of life of people with dementia (PWD), it is essential to maintain their independence as long as possible. However, due to the progressive deteriorating nature of dementia this can become increasingly difficult. Estimates of the proportion of people with dementia who live in care facilities range from 19% to 49% meaning there are many informal carers e.g. family members and friends assuming the role of primary carer for their loved ones. Research suggests that carers of people with dementia often display poor health as compared to their age matched peers and therefore require as much assistance as possible to be able to support PWD, while maintaining their own well being. Physiotherapy is one way which can help promote independence in PWD. A physiotherapist can help reduce the burden of care by educating the carers and providing individually tailored strategies to encourage independence in these individuals. A physiotherapist works as part of the multi-disciplinary team (including doctors, nurses etc) to ensure a high level of care for people with dementia. 4. Highlight dementia services and resources which can be accessed when required. The information on this page has been adapted from two up to date national guidelines which recommend physiotherapy as part of the care for these individuals. Other countries also have their own guidelines. As dementia progresses, your loved one may start behaving differently, being less physically active or begin struggling to communicate with you. There are several 'Dementia Danger Signs' that should be aware of, these are listed below. 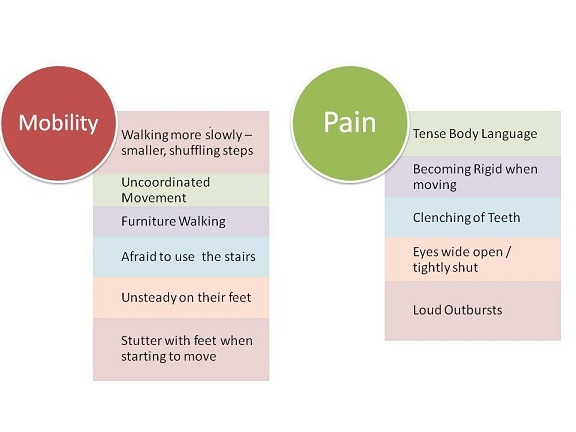 If you start noticing any of these, you may need to use methods to help these individuals to maintain their mobility which are provided in this leaflet or if you feel these are becoming worse, contact your nearest physiotherapy department. As the disease progresses problems with mobility will increase. Some people with dementia eventually become confined to a bed or chair. If you notice any of the danger signs regarding mobility and feel your loved one requires more and more assistance getting around and completing daily activities then you should seek advice from a physiotherapist on how to help the person to move without injuring themselves. Most dementias will at some point in their course affect areas of the brain that are responsible for a person's movement and balance. By exercising and keeping active, PWD keep their joints, muscles and heart in good shape and build a reserve. Exercise and participating in activities also provide an opportunity for PSE to engage with their surroundings. As the caregiver for a PWD, there are some things you can do to encourage activity safely. Before you consider helping someone walk, make sure they have comfortable footwear, the correct glasses and hearing aids, and that their clothing is secure. Every person with dementia will be different in terms of how much ability they have, however it is important to involve them in decision making and make activities specific to what they enjoy. Know their strengths and use them to your advantage. If they require a walking aid, ensure it is within their reach before walking and if giving assistance, do so at their side so you are both facing in the same direction and move together. Be realistic about how much activity can be done at one time. Aim to cover a short distance, to a seat that the person can see. Provide a resting place, such as a chair or stool, halfway. Give the walk a purpose. For example, to eat a meal, watch TV, see a visitor, go to the toilet, or do some exercise. Reassure the person about their surroundings. For example, if moving from hard to soft floor coverings. Make walking an enjoyable experience by talking to the person and paying them plenty of attention. If they begin to shuffle their feet when walking, encourage marching so to lift their feet. How can the physiotherapist help? Chronic pain is significant among older adults, particularly those with dementia. Between 43% and 71% of people suffering with dementia are in pain. Yet pain is under diagnosed and under treated in this population. Some dementia patients have trouble communicating their pain experience to their carers or family members because of dementia. In severe cases of dementia, this can leave pain levels being under treated as many believe that pain is a normal and expected part of getting old and that PWD can’t feel pain. However, these are both untrue and pain can be treated with dementia patients through a good working relationship between both the carer/family and the physiotherapist and GP. For help in looking out for signs of pain in PWD see the University of Alberta (Canada) for video and training. If you notice your patient or loved one showing any of the 'Dementia Danger Signs' listed above, you should arrange an appointment with your local GP as soon as possible or talk to your physiotherapist about this. This will allow the medical team to assess whether their medication needs to be changed or strengthened. This is very important as your loved one may be in fairly severe levels of pain during movements and while dressing, washing, which reduces their quality of life. Physiotherapists are trained to recognise if any persons with dementia are in pain during activity or exercise. It is important to know that pain can affect an individuals motivation to do any exercise or activities. If pain becomes a problem with your loved one, your physiotherapist can provide information to help recognise pain and put in place strategies to help lessen pain levels and improve the quality of life of the patient. The Coloured Analogue Scale is a scale often used by both physiotherapists and carers to measure the amount of pain that the patient is feeling. The scale goes from 0-10 and the colour changes as the amount of pain changes. The patient is asked to use a sliding bar to tell the carer or physiotherapist what level of pain they are feeling. However it has to be used with caution as the reliability of the scale decreases as the disease progresses. As the patient goes from having mild to severe dementia the scale has been shown by scientific research not to give as true a reflection of how much pain the PWD is feeling. For PWD who are non-verbal, the Abbey Pain Scale is an appropriate outcome measure to assess and monitor for pain. The Abbey Pain Scale uses observations of the PWD e.g. looking for grimacing, wincing in response to movement. Try to ensure the patient wears suitable clothing and footwear that he/she is unlikely to trip over. If you feel you require more assistance with your home environment or you would like a home assessment then you can request help from a Physiotherapist or Occupational Therapist (OT). Carry out a home assessment and advise on devices which will increase safety and promote functional abilities. Provide balance training to improve confidence and reduce the risk of falls. Increase patient motivation to decrease fear and anxiety. Help with exercises for simple everyday things like walking, rising from a chair etc. As a caregiver, it is important you learn to look after your own needs. Here are a few recommendations to help you cope with the demanding role of looking after someone with dementia. Take breaks from care-giving as often as you can by asking other family members to help or accessing carer support where available. Don't be afraid to ask,people will be happy to lend a hand but may feel nervous around the person with dementia. • Tell them exactly how you are feeling and what you need. • Be specific and positive about what tasks you would like them to do. • Let them know you appreciate their help and that it is making your burden slightly less. • It may be helpful to ask people to help you with everyday tasks such as shopping and cleaning the house. You may think these tasks are unrelated to direct care-giving but a little assistance can go along way. Guideposts aim to provide services to help all people lead independent lives, this includes those who suffer from dementia: Registered Charity number 272619. Alzheimer Scotland is the leading dementia organisation in Scotland. They campaign for the rights of people with dementia and their families and provide an extensive range of innovative and personalised support services: Registered Charity number SC022315. The mission of Dementia UK is to improve quality of life for all people affected by dementia: Registered Charity number 1039404. The aim of Dementia Web is to help people who suffer with dementia, as well as their family, carers and professionals who care for them, by providing information about the support and care services available. For patients and carers who are interested in finding out more about the physiotherapist role in dementia, the Chartered Society of Physiotherapy (CSP) website can provide an insight into the roles and responsibilities a physiotherapist has. The CSP is the professional, educational and trade union body for the UK's 50,000 chartered physiotherapists, physiotherapy students and support workers. Company registration number RC000107, Copyright 2012. Dementia Australia provides a practical guide for carers of PWD. ↑ National Health Service. Dementia Guide: Symptoms of dementia. Accessed 21 November 2018. ↑ 2.0 2.1 World Health Organisation. Dementia. Available from: http://www.who.int/news-room/fact-sheets/detail/dementia (accessed 19 November 2018). ↑ Chartered Society of Physiotherapy. Physiotherapy works: dementia care. 2011. Accessed 21 November 2018. ↑ Lepore M, Ferrell A, Wiener JM. Living Arrangements of People with Alzheimer’s Disease and Related Dementias: Implications for Services and Supports. Research Summit on Dementia Care: Building Evidence for Services and Supports; 2017. Accessed 18 November 2018. ↑ Australian Institute of Health and Welfare; Australian Government. Australia's welfare 2017: in brief. 2017. Accessed 18 November 2018. ↑ Oddy, R. Promoting mobility in patients with dementia: some suggested strategies for physiotherapists. Physiotherapy Theory and Practice1987; 3(1): 18-27. ↑ AGS Panel on Persistent Pain in Older Persons. The management of persistent pain in older persons. J Am Geriatr Soc 2002;50(6 Suppl):S205-S224. ↑ Hadjistavropoulos T, Herr K, Prkachin KM, Craig KD, Gibson SJ, Lukas A, Smith JH. Pain assessment in elderly adults with dementia. Lancet Neurol. 2014, 3;12: 1216-1227. Accessed 21 November 2018. ↑ Closs SJ, Barr B, Briggs M, Cash K, Seers K. A comparison of five pain assessment scales for nursing home residents with varying degrees of cognitive impairment. J Pain Symptom Manage. 2004, 27;3:196-205. Accessed 21 November 2018. ↑ Pautex S, Herrmann F, Le Lous P, Fabjan M, Michel JP, Gold G. Feasibility and reliability of four pain self-assessment scales and correlation with an observational rating scale in hospitalized elderly demented patients. J Gerontol A Biol Sci Med Sci. 2005, 60;4:524-9. Accessed 21 November 2018. ↑ Allan LM, Ballard CG, Rowan EN, Kenny RA. Incidence and Prediction of Falls in Dementia: A Prospective Study in Older People. PLoS One. 2009; 4(5): e5521. Accessed 21 November 2018.